Jenn Simmons of the Web Platform podcast recently had Famou.us CEO, Steve Newcomb on the podcast to discuss the mobile performance and their upcoming mixed mode. This was perfect timing, as Microsoft had just released ManifoldJS, a tool which allows you to package your web experience as native apps across Android, iOS, and Windows. I wanted to put these two technologies to the test. 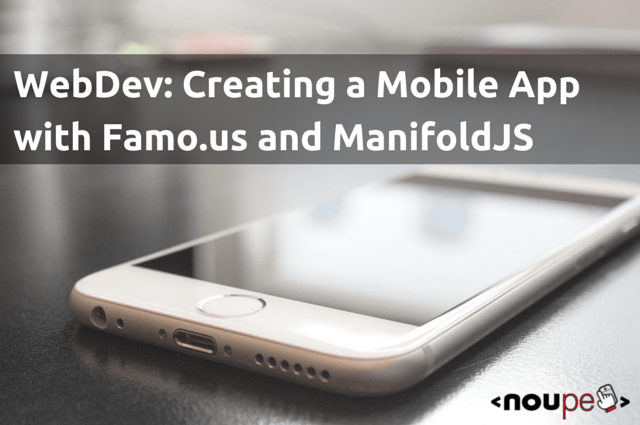 In short, I wanted to determine if Famo.us does actually have great mobile performance, as well as have an understanding of how straightforward the process was for packaging my web application as mobile app. What Problem do These Two Things Solve? The web isn’t necessarily known for creating high performance applications, which is a shame because it truly is capable of blazing fast interactive apps, but sadly has been plagued by the DOM. With technologies like the HTML5 canvas, WebGL, and asm.js, the browser really can be a playground for cutting edge interactivity. Famo.us aims to solve this getting around the bottleneck for most web applications, which is the DOM, and utilizing WebGL and abstracting your work from the DOM. More on this later. 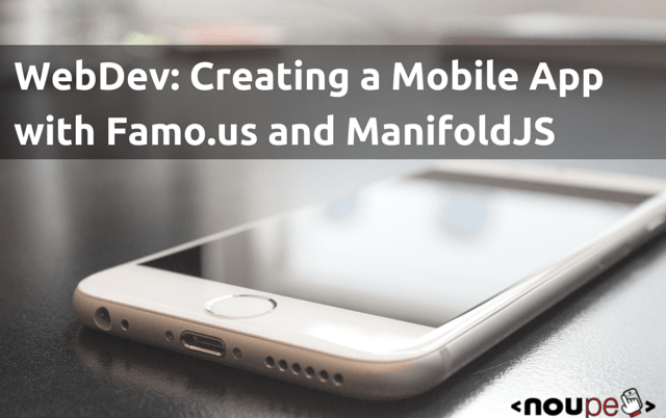 ManifoldJS aims to make the life of a mobile developer easier than ever by utilizing Web App Manifests, which allows websites to declare app-like properties. ManifoldJS uses that standard for those platforms that support it, but falls back to Cordova for those that don’t. Cordova is great, but the W3C also considers work done at Mozilla (Firefox Open Web Apps), Google (Chrome Hosted Apps) and Microsoft (Windows 8 had local web apps, Windows 10 extends over to hosted web apps). With this, we can now wrap websites and create hybrid applications that can be deployed in the various app stores, while still taking advantage of many native aspects for each device (contacts, calendar, file storage, gyro, GPS, etc.). When we combine the two, we can create applications at native speed that can be deployed in a number of app stores, utilizing largely one code base. There is no silver bullet for mobile development, but this certainly makes the process easier. Famo.us has a University page, which provides a great starting point for understanding how the framework works, as well as offering a few sample projects. I ran through all of the courses on the University site and came out with a pretty clear understanding of how the framework works. They also have integration with other libraries too, such as Angular, but I haven’t had time to dive into that just yet. Next, I clicked on the link at the top-right corner of the page to download their package of guides and two example projects. This is different from what is found on their GitHub. I opened the famous-starter-kit folder and navigated to /reference-tutorials and found folders for /slideshow and /timbre. 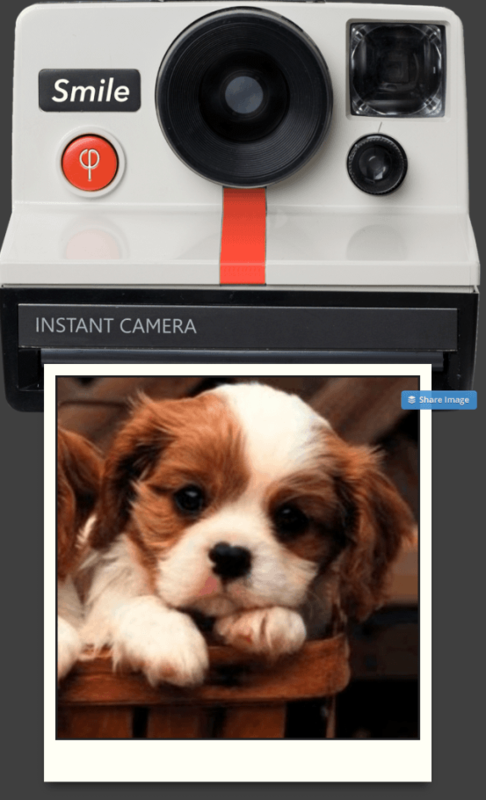 Slideshow is pretty clever; it grabs images from Picasa and draws them to the screen as though they came fresh from a Polaroid camera. You can find a live version of this on my site. Out of the box though, it didn’t work. I soon realized what the issue was, though. Their sample pointed toward an invalid Picasa URL. It’s been six months since the sample was released, so I would hope that it would be corrected by now, as I’d imagine this would be a damper on a number of people learning to use this otherwise fantastic framework. Once I changed the URL in the SlideData.js file, all was fine. What the project does is grab images from a Picasa album and draw them to screen. With each click, the camera drops the current image, and a fresh one is ejected from the front of the camera, and is quickly exposed before your eyes, along with some nice physics applied to the swaying back-and-forth of the image. The step-by-step instructions for creating this project can be found here. There is another project in the /timbre folder, but I wasn’t able to get that to work either. You can find the associated tutorial here though, and at least walk through the process of building it yourself. I’m not going to spend too much time getting into the detail of Famo.us here, but if you really want to dive deeper, this article on Medium is a great overview. Interacting with the DOM is riddled with performance issues. Famo.us abstracts away DOM management […] If you inspect a website running Famo.us, you’ll notice the DOM is very flat: most elements are siblings of one another. […] Developers are used to nesting HTML elements because that’s the way to get relative positioning, event bubbling, and semantic structure. However, there is a cost to each of these: relative positioning causes slow page reflows on animating content; event bubbling is expensive when event propagation is not carefully managed; and semantic structure is not well separated from visual rendering in HTML. Famo.us promises a rich 60 FPS experience, and to do so, we needed to circumvent these inefficiencies. By utilizing the CSS3 primitive -webkit-transform: matrix3d, along with the hardware acceleration it affords, we can get far greater performance than we could if we just tinkered with the DOM. Any time you touch the DOM, it is expensive. Nicole Sullivan, a fantastic web developer known for her CSS work, gives an excellent explanation of reflows and repainting inside of the browser, and how we can avoid these issues. Fortunately, Famo.us abstracts all of this away from us. Now we’re talking my language! Some high performance applications in the browser! The installation process for ManifoldJS is pretty straight forward. Check out their GitHub for more information. Jeff Burtoft also walks you through the process of creating a hosted web app at ThisHereWeb.com. This project will continue to evolve over the coming months. In the last week alone I’ve seen several additions alone. On platforms which natively support web applications, such as Windows 10, Chrome OS and Firefox OS, ManifoldJS will create native packages. On platforms such as iOS and Android, Cordova is used, which allows a developer to write a web application but still access many of the native features of a device, either through Cordova itself, or the active plugin community. 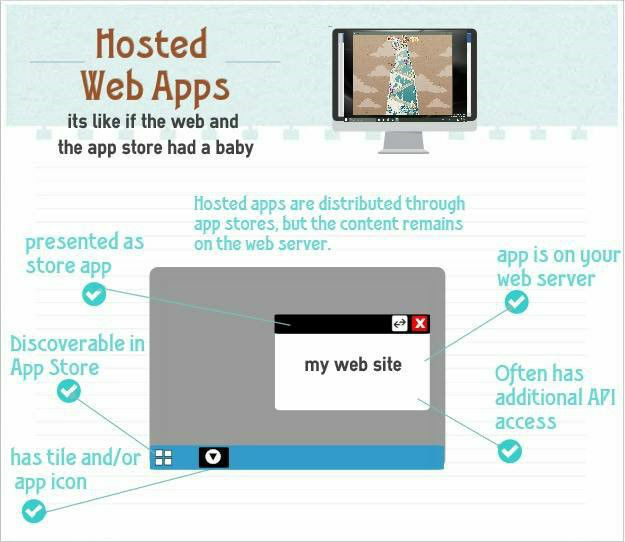 Jeff Burtoft explains hosted web apps very well on his blog or in his recent //BUILD/ presentation. I’m doing this tutorial from a Mac Book Pro running Yosemite 10.10.3, Visual Studio Code as my IDE, and MAMP as my local web server. I then use Source Tree as my Git tool of choice, and host my open source code on GitHub, and I’ll be deploying to iOS via Xcode. I know, a Tech Evangelist at Microsoft using Apple products and telling you about open source tools. What is the world coming to? The first thing I did was download the Famo.us samples from their website. I made the appropriate changes to their SlideData.js file, as I mentioned above, so that my project was able to pull in feeds from Picasa. I’ve uploaded it to GitHub so that you had a sample which worked immediately. View the live site here and head to GitHub to download the working project. Afterwards, I logged into Azure and created a new website. You can get $200 worth of Azure trial credits here or reach out to me about a free BizSpark membership for yourself or your startup, which grants $150 /month of web hosting. 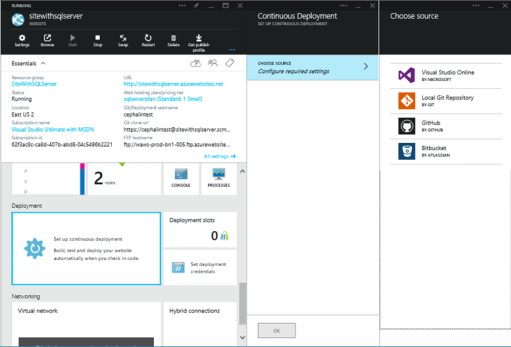 I then point this new Azure Website at my GitHub repo. Scott Hanselman explains how to do this in a few steps. From there, I have Azure monitor my GitHub repo for this project, and any changes I push to that repository are immediately picked up by Azure, and the latest changes can be viewed on the website and Manifest project immediately. 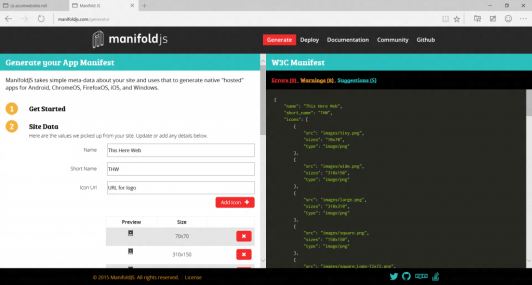 Next up, we need to use ManifoldJS to “wrap” our web app so that we can deploy it to the various app stores. Firefox OS and Chrome support this natively, but for iOS, Android, and Windows 8 or 10, we need to utilize Cordova. ManifoldJS will generate an App Manifest file for us, which has all of the information the app stores need to get our project going. You have two options here: Use the Manifold Web App Generator, which will provide a GUI and step-by-step instructions, or run it through the command line. The path following -d tells ManifoldJS which directory I want it to be stored it. Soon after, you should the terminal building the project before your eyes. Navigate to where you stored this project, and you’ll find a series of folders there. 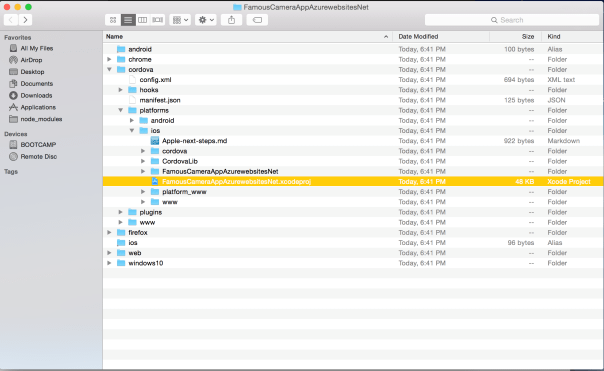 I then navigated to cordova/platforms/iOS and looked for the file ending in xcodeproj, as I wanted to test this out in the iOS simulator. 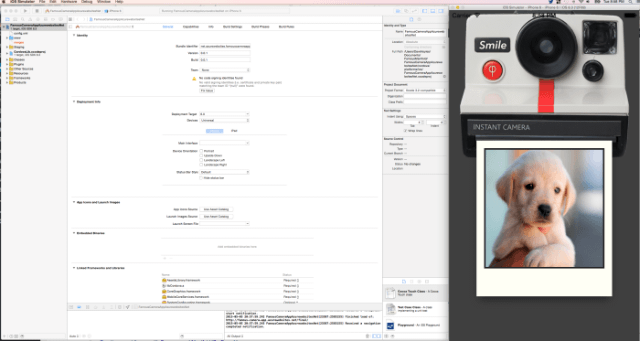 Double click on that icon to open the project in Xcode. And there we have it, a Famo.us application running inside of Cordova on iOS. I plan to try out Angular + Famo.us in one of my upcoming demos, as well as wrapping that in Manifold to test for performance on iOS. If you’re looking to debug these apps, might I suggest looking at VorlonJS? It’s platform-agnostic, takes a minute to set up, and in the link above, I illustrate how I can test apps on a desktop browser, as well as mobile devices. I’d really like to stress test what mobile browsers are capable of when combining a framework like Famo.us and Cordova, so look for a sample involving those two soon. As the web continues to evolve, Microsoft will continue to update its dev.modern.ie/platform/status/ site to reflect changes to the new Edge browser. The most exciting announcement to me though is the recent switch from “in development” to “in edge” tag for asm.js. Soon we’ll be able to run native applications inside of the browser — It’s an exciting time to be working on the web. Excellent article. I have to admit that I have been searching for this information for a long time. Reading this wonderful entry I have known many new things. As I see all your articles are informative and full of valuable information so I will definitely bookmark your website and wait for more such great posts like this one. So huge thanks for publishing this article here.